On most application programs and web browsers, the password field is protected and masked with asterisks (or stars aka ********* symbols) when user entering the secret credentials into the text box on web pages or program’s interface to avoid hacker peeps over the shoulders. Asterisk masking of password is good security measure. However, in some scenarios, there may be a need to reveal and show the hidden password string or value hidden behind the asterisks. For example, almost all web browsers such as Internet Explorer 6, 7, 8 (IE6, IE7, IE8), Firefox, Safari and Opera (Wand) now able to remember the user ID and password login information for web sites on behalf of users to facilitate easier user name and password entry or automatic sign in. The same save or remember logon name and password credentials feature convenient feature also applies to desktop programs such as Microsoft Money, FTP, SSH and Telnet client, Windows Live (MSN Messenger), Yahoo! Messenger, Google Talk, Skype, AIM, and most other instant messengers and VoIP clients. So when user forgets or misplaces the password for particular website or service or software application, it’s possible to retrieve and recover the password from the saved password, if user can reveal and view the masked password hidden under the asterisks on password field on web pages or program’s user interface. Here’s a list of asterisk password revealer or asterisk password viewer tools and utilities that able to read, reveal and display the actual real password that is hidden and masked with asterisks. Only working freeware which available for free download is listed here. Asterisk Key from PassWare (lostpassword.com) shows passwords hidden under asterisks. Best of all, it’s totally free. 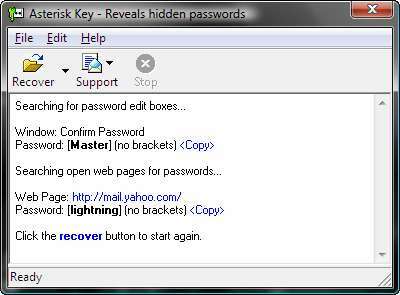 Asterisk Key features include uncovers hidden passwords on password dialog boxes and web pages on web pages or Windows apps, state of the art password recovery engine that able to recover all passwords instantly, multilingual passwords supported and full install/uninstall support. In Windows Vista, run Asterisk Key as administrator, or else it won’t find any password edit boxes on window nor web page. 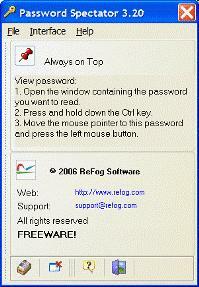 Password Viewer by IT Samples is a Windows utility that allows you to view password fields. It enables to you to peek the password not only at the password edit boxes on different programs, but also the password input field data on a page inside Internet Explorer window. Works in Win2000, WinXP and WinVista. No installation required, and user just need to click on the “hand” icon and drag window over the password edit control or password input field and the password text will appear on Password Viewer dialog. IE Asterisk Password Uncover from NSAuditor (password-recovery-software.com) allows you to view passwords hidden with asterisks in password fields in web pages and ActiveX controls. Comes in handy when you have forgotten your passwords. When you login into a web site with user name and password, you sometimes have the option to store the password in your computer. This freeware utility reveals the passwords stored behind the asterisks (****) in the web pages of Internet Explorer. Password Spectator lets user “see” what is behind the asterisks, so you can see your actual password when you need it. Password Spectator works both with Internet sites and with software applications that require entering passwords. This software works with the overwhelming majority of applications. For example, password fields present in ISPs in dial-up dialog boxes, in CuteFTP or Outlook Express. The only exception are the programs that actually “store” asterisks behind the asterisks. Windows NT User Manager does not hide actual passwords “under” the asterisks, and thus won’t work. Most applications under Windows allow you to store their passwords. Examples are the passwords of ISP’s, the password of your email client or FTP tool. Once the password is stored, it is hidden under a row of “***” asterisks and cannot be read again. The nifty SC-PassUnleash asterisk password reader utility from Soft-Central allows you to read any of your passwords that are covered by the asterisks by simply dragging a cursor over such a password field. Once the cursor is on top of a “***” password field, SC-PassUnleash instantly displays the password in readable text on screen. SC-PassUnleash only works on certain FTP clients and email clients. It doesn’t support most web browsers and user account manager. Asterisk Logger from NirSoft is a successor of AsterWin utility. It reveals the asterisk typed passwords in standard password text box in many applications, like CuteFTP, CoffeeCup Free FTP, VNC, IncrediMail, Outlook Express, and others, that the real password is not displayed on the screen, and instead been replaced with a sequence of asterisk (‘****’) characters. Asterisk Logger supports Windows 9x, Windows NT, Windows ME, Windows 2000, and Windows XP. But it doesn’t work on Internet Explorer. Just run the executable, no installation required. Don’t support Netscape 6.x (passwords in the Web page), dialup and network passwords in Windows 2000 and Windows NT/2000/XP user management tools. This utility reveals the passwords stored behind the asterisks (‘***’) in standard password text-boxes. It supports the following operating systems: Windows 95, Windows 98, Windows ME, Windows NT, Windows 2000 and Windows XP. Don’t support Netscape 6.x (passwords in the Web page), dialup and network passwords in Windows 2000 and Windows NT/2000/XP user management tools. When you login into a web site with user name and password, you sometimes have the option to store the password in your computer. If you choose to save the password, in the next time that we’ll visit this site, the password field will be automatically filled with your password, but you won’t be able to view it, because the password-box shows the password as sequence of asterisks (****). Some asterisk revealer cannot process Internet Explorer Web pages, because the password is stored in different way than in other applications. However, AsterWin IE utility reveals the passwords stored behind the asterisks in the web pages of Internet Explorer 5.0 and above. You can use it for recovering a lost web site password, if it’s stored on your computer. AsterWin IE supports Windows 95/98/ME or Windows NT/2000/XP with Internet Explorer 5.0 or above. It also requires VB6 Runtime files. Asterisk Master by IT Samples is an Internet Explorer plug-in residing in Status Bar that allows you to reveal passwords hidden behind the asterisks in password fields inside any web page directly and keep these input fields unmasked. When Internet Explorer has finished opening any web page, Asterisk Master starts searching for a password input box and substitutes it with a usual text input box, so any hidden characters become readable. ShowPassword allows to view the passwords which are hidden by asteriks on some program where user defines a password such as mail accounts, personal code to private folder, login in network or Window login. Supports mostly Windows apps. Password Revealer by rekenwonder is a utility for Windows 95/98/Me/NT that can show you most passwords that are typed in a password edit box (those that hide the password and show asterisks instead). If you’re using Windows 2000, XP, Server 2003, Vista and Server 2008, or IE5 and above, forget about this and try alternative asterisk password readers above. For user just want to read, view, reveal and display hidden asterisk password in various web browsers, View Passwords Bookmarklet may be an easier and simple solution. These free programs listed above able to reveal and show the actual password characters hidden beneath the asterisks because the password is still stored in the window control although it’s shown as asterisks and real value is not displaying. Note that the asterisk password recovery revealing tools is meant for password recovery purpose. They won’t be able to decrypt and show Windows logon password (and password in User Account Manager in Control Panel). To safeguard from this kind of hack, physical security control is required.